IntelliScanner Help - How do I move my Inventory database to a new computer? How do I move my Inventory database to a new computer? Below are the steps for moving your Inventory data that you backed up using the Backup utility in the IntelliScanner Dashboard. Next, by default, Inventory will save it database file to the "Documents" folder in your Home directory (though it's possible to save it elsewhere). 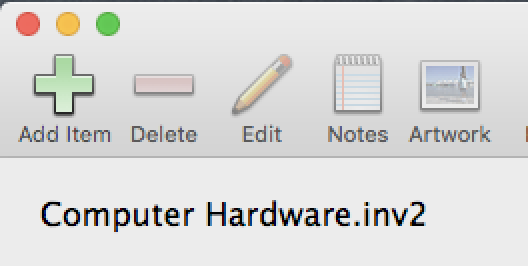 The database file name will be based on whatever template you choose - for example, in this screen shot, you can see that the database file name is "Computer Hardware.inv2". Launch Inventory and when prompted to create a new database or open an existing one, select to open an existing database, then select your database file that you moved over to the new computer.